Fortunately, I did not have to travel far to reach my destination. Planet Hazelnut, in case I hadn’t explained, is where the nuts are so robust and bountiful and irresistibly rich with compelling flavor I’m driven mad with anticipation. I can hardly wait to sink my teeth into those little darlings! Planet Hazelnut is where the sweet aroma of roasting hazelnuts sends such captivating drifts of fragrance into the air I can barely contain my well-trained good manners waiting for them to cool. Oh, so sorry! I just realized I had neglected to provide the geographical location of Planet Hazelnut so you could indulge each of your sensory receptors as I have. Planet Hazelnut is actually rather close by. It’s in my kitchen and yours, too! By now you’ve probably figured out I’m a doting hazelnut enthusiast, as well as a lover of all kinds of nuts. People often ask what my favorite nut is, but how can I possibly choose one. It would be like asking which of my four children is my favorite. The honest to goodness truth is I adore them all—my children and my nuts! But hazelnuts sit on a special pedestal in my heart. Because I’m admittedly fickle, I do have temporary love encounters with one nut or other at any given time; and my heart just might flit to another nut at the mere sight of it. Yesterday, I was enchanted with HAZELNUTS, those precious little sweethearts—so round—so sweet—and so richly endowed with flavor. While my usual preference is raw hazelnuts with their gifted fresh, natural sweetness and pleasing chewy texture, I do adore them roasted. Roasting changes them so dramatically I think of hazelnuts as having split personalities. Roasted, they literally charm my willing taste buds like a sorcerer working his wizardry. Their crisp crunch is instantly appealing, their flavor heightened and enhanced with assertive earthen headiness. Taking full advantage of their alluring nature, I placed a hefty quantity of hazelnuts onto a baking sheet and tucked it into the oven at 325 degrees for 15 minutes. I wanted to prepare them for a unique dessert I had in mind for an after-theater dessert party. When I checked them after 15 minutes, I noticed their skins were beginning to split apart. That was my signal to take them out of the oven. Then, I blanched them by placing them on a double layer of kitchen towels. I wrapped them completely and allowed them to sweat for 10 minutes. Next, I rubbed them vigorously in the towels to coax their skins off. Some were more willing than others, but the few that still clung protectively to their skins were not going to pose any problem to the finished pie I was planning. Finally, I placed the roasted, blanched hazelnuts into a heavy-duty plastic bag, positioned it on a firm cutting board, and whacked them into coarse pieces with a hammer I keep handy in my kitchen for such tasks. 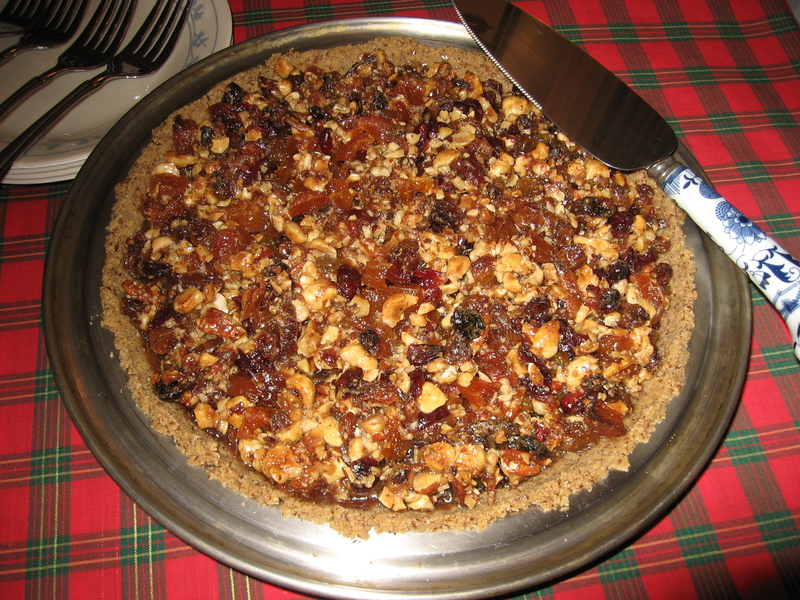 The chopped hazelnuts were now ready to join a host of delicious fruits in a tantalizing pie with a divinely chewy nougat texture. The novel pie, I admit with unabashed immodesty, was ragingly delicious. Those roasted, blanched hazelnuts made the pie stand out from others by adding the defining element of crunchy nuance that most pies lack. I simply couldn’t wait to share this wonderful dessert with all who adore hazelnuts. I trust you’ll savor it to the last crunchy tidbit. Any time you blend dried fruits with hazelnuts, you’ve introduced the basic elements of an exceptional sweet treat. By combining the merry makings of four different fruits with crunchy, roasted, chunky hazelnuts and pecans, spicing them up, binding them with a magical medley of sweeteners, and voila!—you’ve created a stunning pie for the Christmas holiday! Because the pleasantly chewy texture of the pie is reminiscent of nougat, be sure to use a firm, serrated knife to cut into servings. It’s the perfect make-ahead dessert that keeps well in the refrigerator for up to five days. This is one dessert that’s a dinner host’s dream because there’s no last minute fuss. 1. Preheat the oven to 325 degrees. Place the hazelnuts on a baking sheet and roast them for 15 to 18 minutes. While the hazelnuts are roasting, place one kitchen towel over the other and place the towels on the counter near the oven. Pour the roasted hazelnuts onto the kitchen towels, fold the towels over to enclose the nuts completely, and allow the nuts to sweat for about 10 minutes. Remove the dark skins from the hazelnuts by rubbing them vigorously in the towels for about 3 or 4 minutes. This process is called blanching. Place the blanched hazelnuts into a heavy-duty plastic bag, position it on a firm counter or cutting board, and use a hammer to break the nuts into coarse pieces. Transfer the nuts to a large bowl. 2. When the hazelnuts are out of the oven, raise the oven temperature to 350 degrees and roast the pecans for about 8 minutes. Remove them to a dish to cool completely and set aside. When cool, break them into pieces and add to the roasted hazelnuts. 3. While the nuts are roasting, combine the brown rice syrup, organic sugar, and maple syrup in a 2-quart saucepan. Add the tapioca flour and stir well with a wooden spoon until the flour is completely incorporated. Set aside for 5 minutes to allow the tapioca flour to absorb some of the moisture. Boil for 5 minutes over medium heat, and then set aside. 4. Add the raisins, dates, apricots, cranberries, cinnamon, orange zest, and salt to the bowl with the nuts and toss well to distribute the ingredients evenly. 5. Add the lime juice, and maple extract to the boiled brown rice syrup mixture and mix well. Add the boiled mixture to the fruits and nuts and mix well to thoroughly coat all the ingredients. The mixture will be very thick and sticky. 6. Spoon the sticky mixture into the prepared pie crust and bake for 35 to 40 minutes. Remove from the oven and set aside for 4 to 6 hours to cool. To store, cover with plastic wrap and refrigerate. Bring the pie to room temperature before serving. Pastry making has been such a challenge for me that for years I tended to avoid making pies at all. That is, until I came up with a few pie dough recipes I could consider friendly to the most timid of bakers. This easy pie dough is impossible to kill. Just toss the ingredients into the food processor and use your fingers to spread it into the pie pan. It’s that easy. To pre-bake the crust for an uncooked filling, spread the dough into the pie pan and cover the dough with aluminum foil, shiny side down. Weight the foil down with a 1/2-inch thick layer of dried beans and bake in a preheated 350-degree oven for 8 to 10 minutes. The process is called blind baking. Remove the beans and allow the crust to stand about 20 minutes to cool before adding the filling. In my effort to be wisely frugal, I rely on beans I keep in the cupboard for this purpose. They can be used over and over. 1. Combine the whole-wheat pastry flour, flaxseed meal, and salt in the food processor and process to distribute the dry ingredients evenly. 2. Add the canola oil and water and pulse and process until well combined and the mixture forms (a) dough that holds together. 3. Spoon the dough into a 9-inch pie pan and use your fingers to spread the dough evenly over the bottom and sides of the pan. 4. Fill the crust with the desired ingredients and bake 350 degrees until done. For a savory pie or if you are eliminating sugar from your diet, omit the sugar completely. For a sweeter crust, add 2 to 3 additional tablespoons of organic sugar or brown sugar.